Let’s be honest today. You know you’ve got something. You know there is something that you can rock in a way that only you can: Parlor tricks you learned in fifth grade that magically entertain restless kids at the family gathering; dated jokes that amuse your crabby uncle at Sunday dinner; starting the campfire with tinder and a flint block; deciphering the ingredients of Kabocha Croquettes in umami sauce after only two savory bites (my cousin can with most restaurant dishes… love it). Consider the little things that you are able to do that very few, if any of your other friends can or are willing to do themselves and love you for it. Even if you don’t think much of it. What is it that you may be underestimating in yourself. We aren’t islands. As people we are meant to be social, and whether we are extroverts, introverts, or ambiverts (like me) we all have things to share within our circles and within our communities. We must give ourselves credit for the hodgepodge of skills we’ve acquired in our lifetimes that actually may contribute to other people’s enjoyment. Especially in our 30s, we have to remember to start sharing again. I have mentioned my background as a teacher on this blog . Even though I haven’t officially worked in my own classroom for some time, my teacher brain, no matter how much I try, is still on, and doubt it will turn off unless I give it another place to live. So in this regard it is an incredible pleasure to say where I am now going to share that particular “something” of mine. My contributor profile on Jennifer Cooper’s Classic-Play. In June ’12, I made my first foray into online classes via Alt Summit and met the wonderful Jennifer Cooper. As the speaker for the online course, “Writing and Finding Your Voice,” she was instrumental in getting me excited about working at blogging one step at a time. 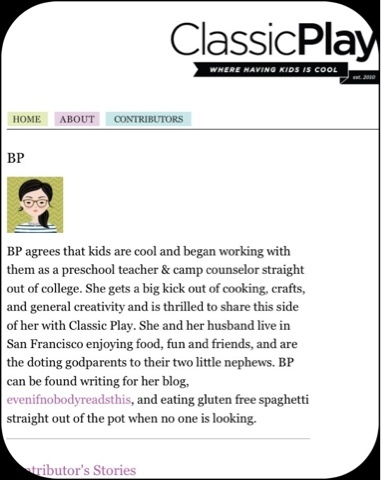 If you have not yet visited Classic Play, I urge you to first of all, because her features are more than a touch cooler than other family focused blogs. I don’t have a family and yet I love reading her activities and ideas. It’s a very engaging site. Second, you HAVE to visit now because my very first Cooking With Kids contribution was posted yesterday right here. My intention is to encourage parental involvement in small group cooking activities for school or a play date in a way that is fun, approachable and meaningful. It is lesson plan style, but if you go through it, you’ll see it is segmented for developmental appropriateness, and therefore is adaptable to each facilitator’s needs. At least that is what the idea is. I do not claim that the recipes will be extremely innovative, but the techniques for group facilitation and substitution of ingredients to accommodate different sensitivities is how I hope to consistently provide something of value. (wow, talk about being in teacher brain mode). So will you please check it out? Tell me what you think! Unless you don’t like it in which case silence is golden. I’m kind of kidding… kind of. More importantly, will you give some thought into what else you have within yourself to contribute? It can be one “something” or seven “somethings”. What and how will you do it? I am convinced you may already know what your “something” is. Just clicked over to read your post. Those photos are adorable! What a great idea! My son used to love to bake with me when he was younger, and even now, he sometimes asks to help. As for my “something?” Hmmmm…still thinking on that one! I have no idea what that something is! Eek. Maybe taking care of children, but that's just because I've been doing it for SO long and that's kind of been my focus. But I don't think I'm particularly good or particularly creative. I can be relaxed because I see the bigger picture, but I can also be lazy. You've totally got me thinking on this!! You have so many somethings from what I can tell so far!!! 😉 Thanks for checking out Classic Play!!!! You are like everyone else, not giving yourself credit where it is due. You'll think of something, and when you do, BE PROUD! 😉 Welcome back, you've been missed!!! !